Whether it’s chest pain, broken bones, a deep cut that needs stitching, or some other emergency, Tempe St. Luke’s Hospital prepared to take care of your medical needs 24 hours a day, 7 days a week. Board-certified emergency room doctors and nurses are trained to handle a medical crisis, and they are committed to responding to your emergency as fast as possible. What Should I Expect At The ER? Triage: When you arrive, a registered nurse will conduct an initial exam, take your vital signs, and complete a brief medical history. Triage helps us determine the severity of your emergency and allows us to take care of the most urgent cases right away. Registration: Once you provide your information, you will be evaluated by a physician, a physician’s assistant, or a nurse practitioner who will determine if your condition is a medical emergency. Evaluation: Once you are in the treatment area, a physician will examine you and order any tests needed to evaluate your condition. Depending on the type of illness or injury, a nurse may start an IV or obtain a sample, or you may undergo diagnostic tests, such as X-rays or a CT scan. Treatment: Your treatment will depend on your physician’s orders after the medical evaluation is complete. Our staff will keep you informed about what to expect during every part of the treatment process. Admission or Discharge: Most patients are treated and discharged to go home from the ER. If you are admitted to the hospital, you will be transferred to a patient room and we will notify your primary care physician. If you do not have a physician, a physician on our staff will coordinate your care while you’re at the hospital. 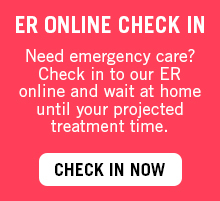 Can I Check-In To The ER Online? Do your or a loved one need to see a health care professional today about a non-life or non-limb threatening medical condition? Skip the ER waiting room and instantly hold your place in line at Tempe St. Luke's Hospital in Tempe from the comfort and convenience of your own home. As is the case for all ER departments, unexpected emergencies may impact those at Tempe St. Luke’s ER waiting room and InQuicker users. Should your projected treatment time be delayed, InQuicker will send you real-time notifications via automated phone calls and emails with updated projected treatment times. With this added convenience, you can continue to wait in the comfort of your own home until your projected treatment time. Whether you choose to wait in Tempe St. Luke’s ER waiting room or in the comfort of your own home, you will receive the same high-quality medical attention that you’ve come to expect from Tempe St. Luke’s. We are prepared to take care of your medical issues 24 hours a day, 7 days a week. Using advanced technology, ER doctors on the medical staff and specially-trained nurses are committed to effectively and efficiently diagnosing and treating your medical issues. Lawn Mowing Safety Tips Each year many children are injured severely by lawn mowers. Power mowers can be especially dangerous. Children should be at least 12 years of age before operating a push lawn mower, and 16 before driving a riding mower. We welcome your feedback about your experience in the Emergency Department, and we encourage you to complete your survey if you receive one in the mail following your visit to our Emergency Department.